Need seating for 12+?...No Problem! I had a client come to me with a simple, yet complex problem...if that is even possible. “I want a dining table that will seat 12 people”. Yikes! That is a big table! You see, this client has a lot of extended family and friends to which they often entertain. In their current setup, they use two dining tables, but then that created two distinct groups and alienated one group from the other. They want to have one table, big enough for everyone to sit at. I should point out that this is, obviously, a large room that previously held two dining tables so the room had plenty of space. After much collaboration and layout, we decided on a table that would be 11 feet long and 5 feet wide. That is a big table! The 11 foot length would easily allow 4 chairs to be placed on each side, with the option of adding another chair if needed. The 5 foot width makes it possible to put two chairs on each end. This configuration comfortably seats 12 people and can be expanded to accommodate 14 people if necessary. Because this table is going to be so large, I needed to come up with a design that would allow the table base to be taken apart if needed. In my design, as you will see below, it is made up of six main components; the two main leg structures at each end, the main support stretcher between the legs, two supporting stretchers under the top and then the wedges that secure the main stretcher to the main base legs. Because this table is going to be so big, one of my main concerns was making the base strong enough to support the top. I failed to mention so far that this table is going to be made from solid red oak; heavy stuff! The top is going to be just over 1 inch thick and 11 feet by 5 feet in size, so it is going to be substantially heavy. The base needs to be, not only strong enough to support it, but visually large enough to not look disproportionate once the top is placed on it. 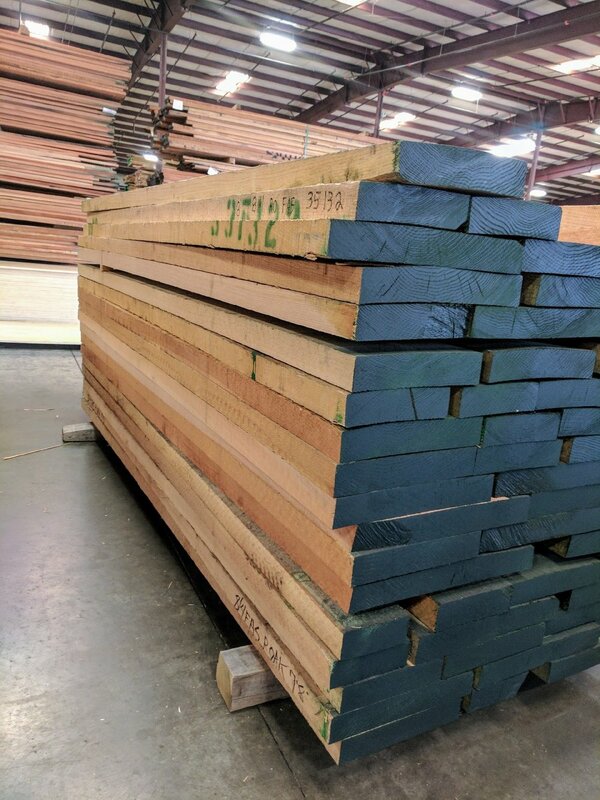 But first, I have to pick through these stacks of rough lumber to find just the right boards. For the base, the first order of business is to glue together two pieces of 8/4 (2" thick) lumber to get the desired thickness. The two main legs are going to be 4 inches square. Hefty! Once the legs were done drying, it was time for the joinery layout. These legs are going to carry a lot of weight so I want a joint that is going to be super strong and durable. I chose to go with a double mortise and tenon joint, with a supporting peg in the joint. Below is the layout for the tenons, which I will cut first. My tenons are going to be 1.75” long, with another ½” haunch at one end. I went with the double tenon because I did not want to remove a lot of material on the mortise side, which I thought would weaken the joint. I think this will make more sense as we go. Here I’m cutting the double tenons by hand, and using hand tools to remove the material in the middle...and making a big mess! Once the tenons were cut, I could focus on the accompanying mortises. I like to use the tenons themselves as my guide for laying out the mortises. I number each mortise and tenon combination to ensure that they always match up and fit as well as possible. Once the mortises are laid out, it is just a matter of removing material, which my hollow chisel mortiser does an excellent job of! Once all of that was done, I just used some hand tools to fine tune each joint to ensure a nice tight fit. I then cut half-lap joints in the middle of each cross member to form an “X”, then I was able to dry fit the whole leg assembly. As you can see in the picture, the cross members are still bulky, those will get a profile before the are finally assembled and glued. Better to do it before you glue it all together! The bottom part of the leg will get a bull-nose type round over while the upper cross member will have a much more shallow round over. This shallow round over, as you will see later, will further keep the legs out of the way from someone banging their knee on it will sitting down. 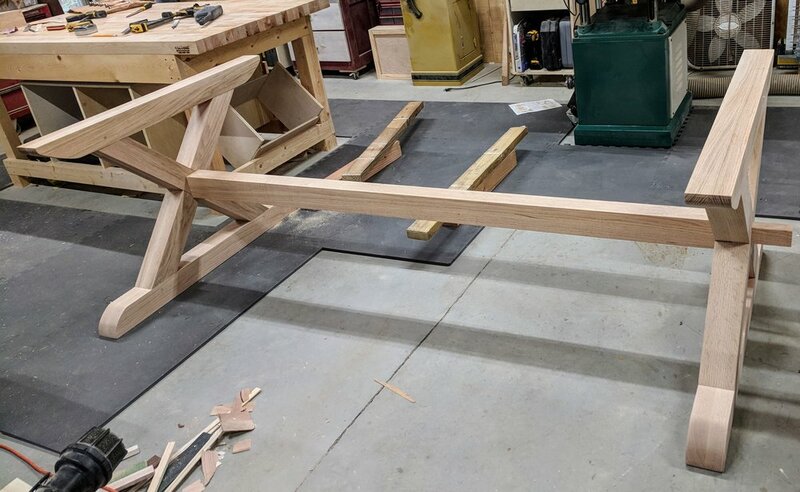 With the legs dry fit and the round overs shaped, it was time to work on the main stretcher that will connect the two main leg structures. This stretcher will provide lateral support to the table to keep the table base from racking and flopping over. 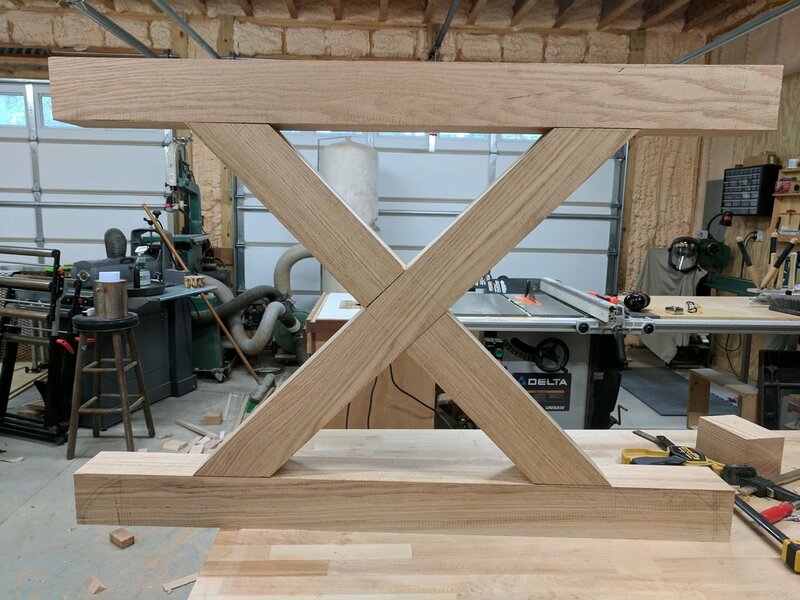 To do this, I had to cut a tenon on each end of the stretcher and then cut a corresponding mortise into the legs where they cross each other. Because this base is going to be a knock-down base, these mortise and tenon joints will not be glued, but will be held in place with a removable peg. To do this, I need to make a mortise on the outside part of the main stretcher tenon. Then I will make a peg that can be driven into the mortise to tighten up the base, but then can also be removed if necessary. Below is another shot of the whole table base dry assembled with the main stretcher. You can also see the peg detail in the mortise and tenon joints of the legs. 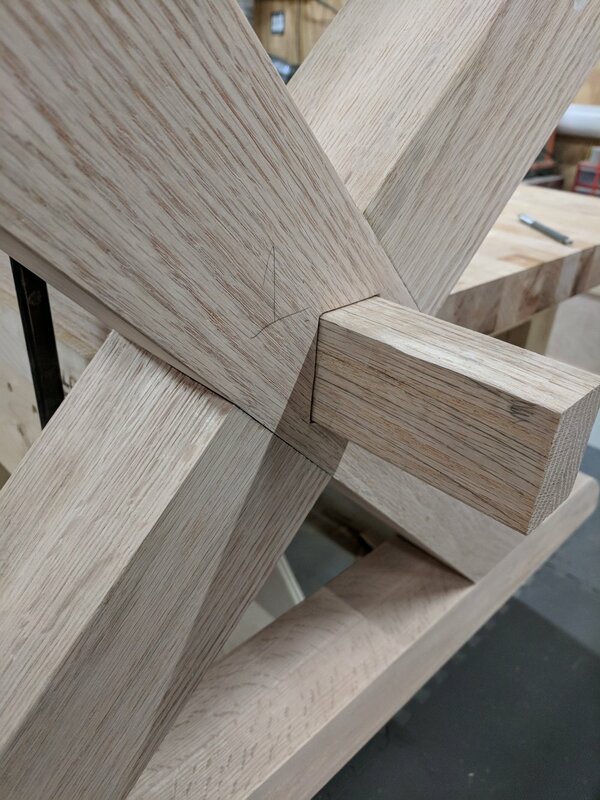 These pegs are driven through the center of the tenon in the joint and provide even more strength to the joint, as well as a nice little design detail. One of the things about woodworking is, even if you have a well thought out plan, you need to be adaptable to changes that may come up. All the way up to this point in the build, one thing I was struggling with was “how am I going to attach this top to the base?” I thought about using large bolts drilled through the main trestle legs, but I was never to keen o that idea. So, I decided to create a couple secondary stretchers and attach the top through them. Because I wanted the table base to be taken apart, I could not glue the stretchers into the base. So what I did is I used sliding dovetail joints to join the two secondary stretchers to the base. This, after I did it, seemed like an obvious solution, but it took me a lot of pondering to get there. In the end, this really served two useful purposes. First, it gave me a method for attaching the top. I simply drilled oversized holes into these secondary stretchers and screwed the top in from the bottom. Second, these dovetailed stretchers added even more strength and rigidity to the table base. These further prevent the top from racking back and forth and really lock the base in tight. In part 2 of the series, we will look at building the massive top and talk about some of the challenges with building such a large top. We will then look at the finish for this table and then have a look at the finished product! Want to keep up to date with posts like this? Simply fill out the form below and get notified.